Several existing customers have asked if we can design and produce a new engine mounting bracket to accommodate a larger diameter pulley cutout area to take a larger pulley to enhance boost pressure output for engines with side mounted supercharger installations. The standard pulley cut-out width is 4 7/8 inch and our new casting has an increased width of 6 1/4 inch to accommodate a pulley size of your preference. 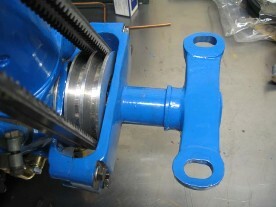 We do not supply the pulley and cannot provide advice on pulley sizes in conjunction with output data as this will be dependent on several factors unique to the engine setup. We can machine these brackets up specially to order. Please note that the one shown above is of modified design in order to accommodate a crankshaft oil seal housing although we can machine to a standard spigot profile. The casting shown above has been produced for Peter Plaskitt's well known Brookland's racing MG PB. This casting can also be used on the J/C/D type. It will also fit the N type if packing pieces are placed on the platform pads as the N type platform pads are a little different in profile. One of our brackets recently fitted and finished in Mid Blue Vintage MG Parts engine paint.